“Shall we head to Mutianyu or Badaling?” Initially, the question meant little. I just wanted to walk the wall, to stand on the Great Wall of China and entangle my thoughts on its history, mystery, and beauty. Being there was surreal, a moment I fantasised about for years. Some say the wall reminds them of a massive dragon, as it travels across the mountains stretching nearly 8,900 kilometres (5,500 miles) from the east to the west of China. Built in sections through the Qin, Han and Ming dynasties, its history spans more than 2,000 years. Improvements have been made to some sections, while others sit in ruins or have disappeared. The two most commonly visited sections are Mutianyu or Badaling, as both are well preserved and easily accessible from Beijing. 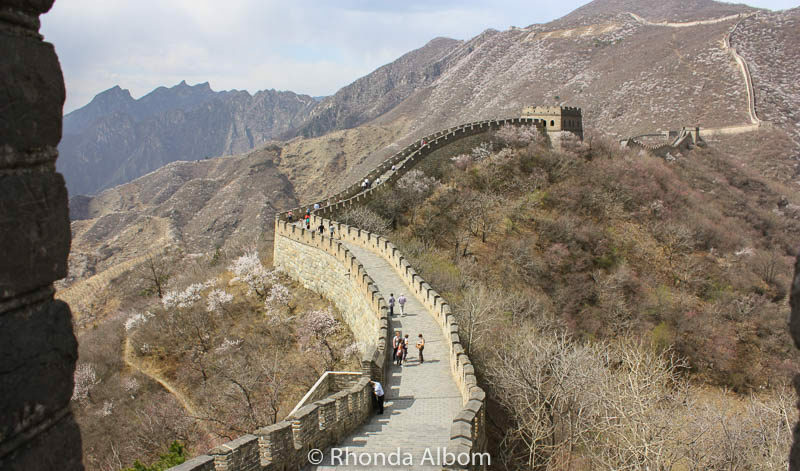 3 Will you walk the Great Wall of China at Mutianyu or Badaling? Here’s why we chose the Mutianyu section. Impressive surrounding forest views, even on a cloudy day. Arriving in April, we just missed the snow covered walkways and were ahead of the colourful spring flowers (although there were plenty of white blooms). Substantially fewer visitors than Badaling (this was a selling point for us). A five-metre walkable path along the top of the wall that runs 5.4k m (3.4miles), with 23 watchtowers. Take time to notice three towers: No. 1 for its large size; No. 6 as it has three hollow towers; and, No. 11 as it is on the branch wall (side wall). Some areas are steep, especially the stairs at the end of the section. 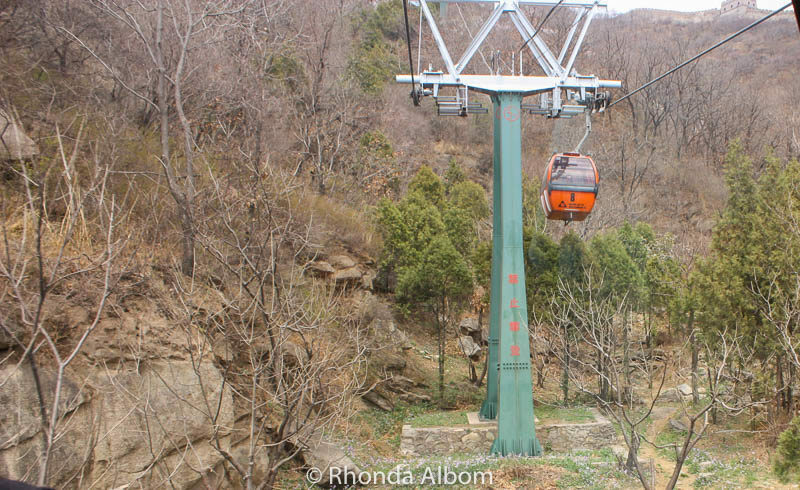 One can walk or take a cable car up to the wall, while there is a luge option for the way down. The Mutianyu section is open in summer from 8 am to 5 pm, and in winter from 8:30 am to 4:30 pm. Cable car up to Mutianyu. Initial views of the wall as seen through the cable car window. 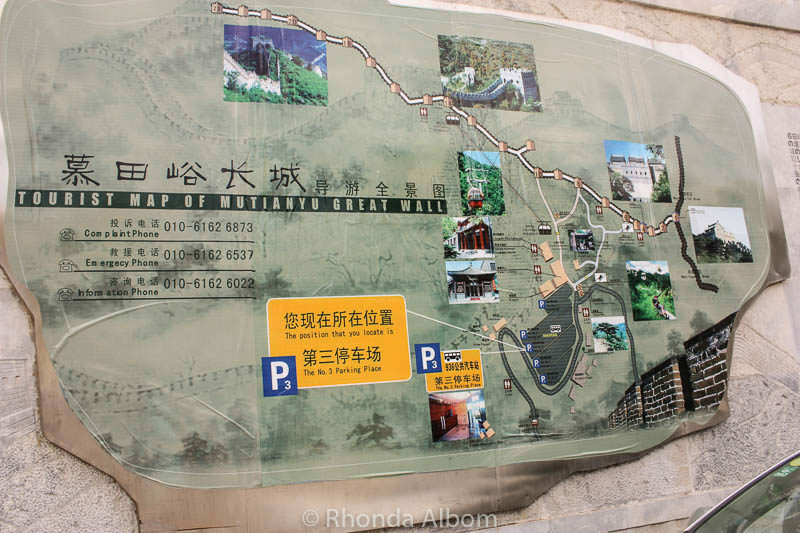 The map at the cable car exit points out the highlights in photos, in English, and in Mandarin. Jeff and I on a branch wall. Steep, but not too steep. Sarah going into one of the towers. The steepest portion of the walk was the steps at the end. Climbing to the top, you are rewarded with endless views. 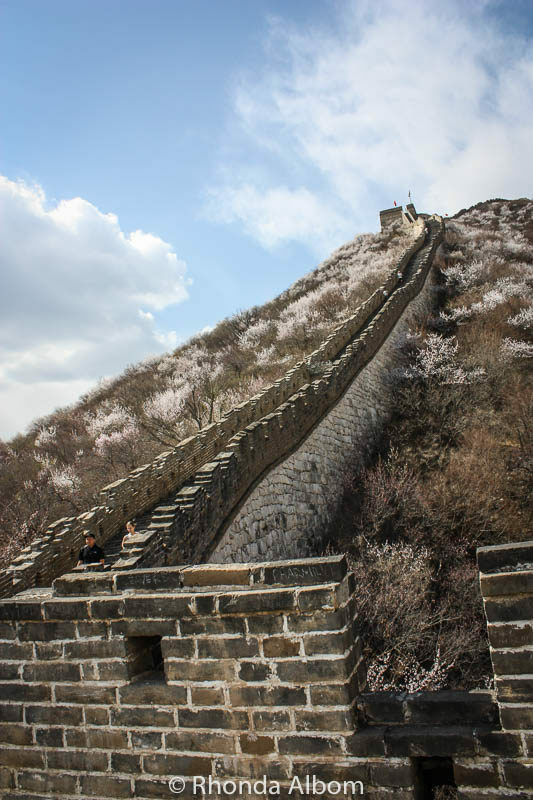 Badaling is the best preserved, most complete, and most popular section to walk the wall. It is nearly always crowded. The portion of Badaling section open to tourists is 3.7 km (2.3 miles) long with 19 restored watchtowers. (The total length of Badaling is 12 km (7.5 miles). It is easier to manage than Mutianyu. Both the path and steps at Badaling are less steep. Plus, handrails have been added to stairs at Badaling. At 6 metres wide, this section of the wall accommodates five horses abreast. It also has a cable car. If you are an early bird or prefer a slightly later visit, Badaling is your choice as it is open in summer from 6:30 am to 7 pm and in winter from 7 am to 6 pm. The Great Wall of China is one of the Seven Wonders of the Middle Ages: Catacombs of Kom el Shoqafa (Egypt), Colosseum (Italy), Great Wall of China, Hagia Sophia (Turkey), Leaning Tower of Pisa (Italy), Porcelain Tower of Nanjing (China) and Stonehenge (England). To date, we have been to five of these. How many have you visited? Some of our other once-in-a-lifetime-experiences in China included standing in front of the Army of the Terracotta Warriors, watching as mama panda helps baby panda climb a tree, riding the world’s fastest train, entering the Forbidden City, walking around Shanghai, and observing everyday life in Suzhou. 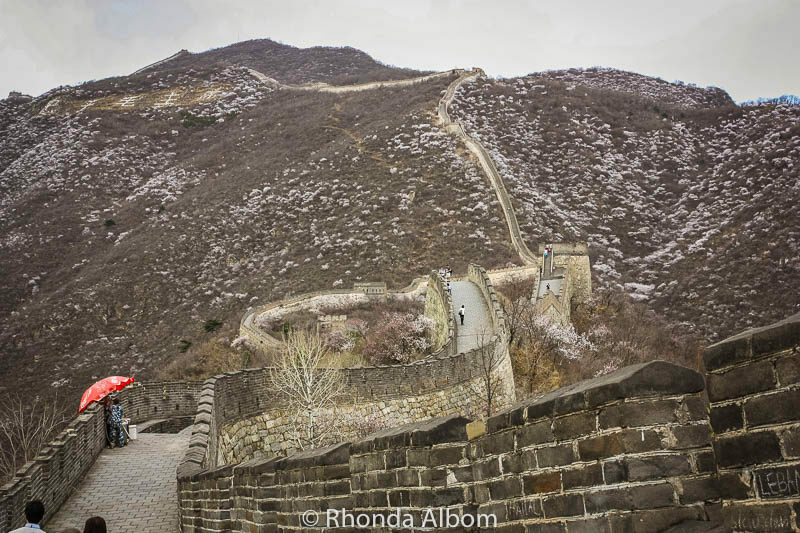 Will you walk the Great Wall of China at Mutianyu or Badaling? Thanks Ben. I appreciate the share. 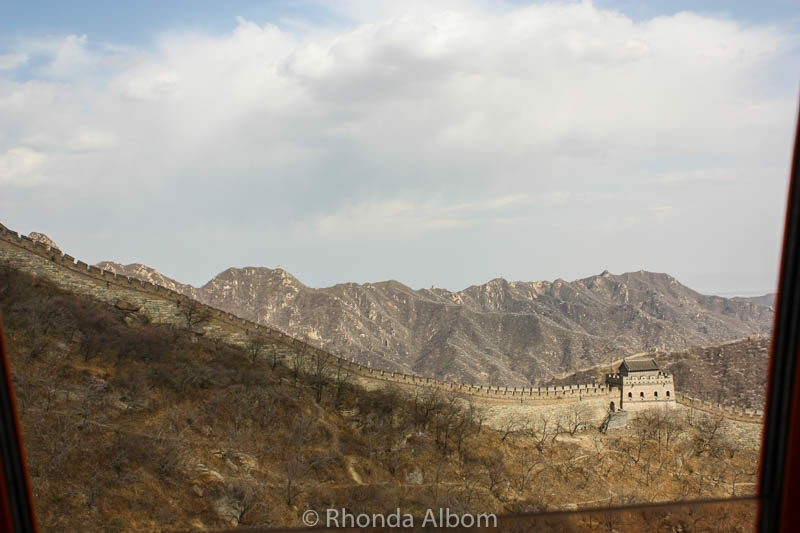 I would love to go to a more deserted stretch of wall if I get back to China. The photos are fabulous! I went to Mutianyu too as I was told that it is less crowded and better sceneries. Thanks. Did you see the spring flowers? We were too early to see them. 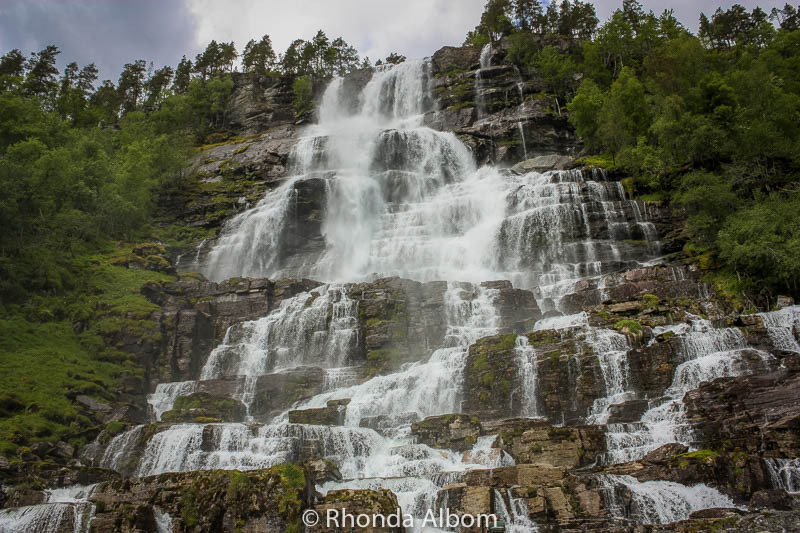 Incredible photos Rhonda! I quite like the almost-bleak atmosphere you get from that time of year. It seems to make the wall stand out even more. My favourite of your photos has to be the one from beneath the wall through the trees looking up. I imagine that’s sort of like the view the Mongols must have had of it and it really looks quite imposing. Great advice on Mutianyu, sounds like the better option when I finally get to visit China and Beijing one day. Thanks David, and yes, the wall was built to look imposing to any enemy. Imagine how much more imposing it would look with an army protecting it from the top of the wall. As long as I’ve been traveling this has been the question, where to visit the wall. I’ve been twice and both times went to Mutianyu, never Badaling. Nowadays, I think they are both really busy, and I’d like to go a little further inland. Wow, you have been twice. That is fantastic. If I went again, I would go to a different section, but probably not Badaling. I agree, one of the more remote ones would probably be fascinating. one of my dreams! hopefully I can visit this place one day.. It was a dream of mine too, for a very long time. So glad I got to walk on the wall. Hope you do too. I really don’t know anything about Jishangling. However, I can say that I was very happy with our choice. No inspectors and permits might have actually increased their speed – LOL. We knew about the steps and were mentally prepared for them. I did Mutianyu as well. Not many people. Wanted to do the more remote places, but it seemed like a hassle getting there and back. We had a driver so it was pretty easy to get where ever we wanted to go. So funny to come across this post. I was in the Badaling section just last month. Was it as crowded as they say? It was the time of year we were there. A few weeks later and it would be filled with wild flowers. I didn’t know they had gondolas there, that would make it so much more worthwhile for exploring the area. They are cable cars to get up from the parking area to the wall. The view at the top is really spectacular! ! I’m looking at your pictures and thinking how lucky your girls are. They have already been to so many great places! Thanks Shere. I just hope my girls know how lucky they are. The Great wall of China … a fantasy of mine … definitely on my bucket list. It was for me too, and it’s one that was worth the effort to get too. great practical information on seeing the wall. I don’t do well with steep, especially going down but the views seem worth braving it. i hope to do this one day! If you don’t like steep, the Badaling might be a better section for you. Go early before the crowds show up. I love your photos of the wall Rhonda. They make me want to visit. I’d chose this section because it doesn’t look crowded at all. Wonderful. Remember, I go out of my way to make my photos look less crowded. 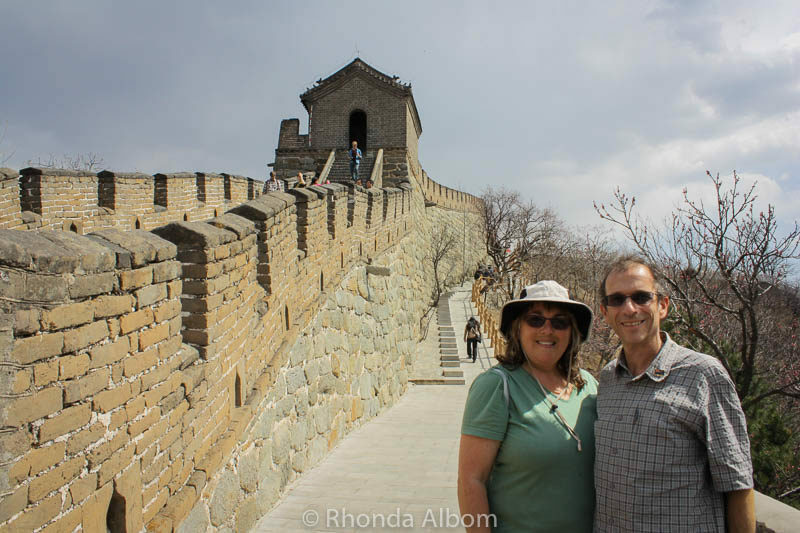 Seeing – and walking – the Great Wall is high on my husband’s wish list. I never thought I had any desire to do this until he starting bringing it up and now, it’s high on my wish list also. I hope we make it there someday – there are so many places to see! It is so much bigger than I ever imagined prior to visiting. I am glad your hubby turned your opinions. I have seen those same those images, and that was a huge part of our decision to head to Mutianyu. That’s true for me too, but I was glad we got to see the Mutianyu section. The Great Wall is on my bucket list! I’ll have to keep this in mind for future travels. I’m all for going to the less crowded section. I think it would be fun to take the luge down too, although probably a little scary too! My girls love a luge, I am more of a cable car kind of girl. It is the most amazing structure. I love your photos. Thanks Lyn, I hope you get there someday. Oh my!! I am incredibly jealous. Walking the Great Wall is really a dream, isn’t it. One day, I hope, one day! It really is, and being there is quite surreal. 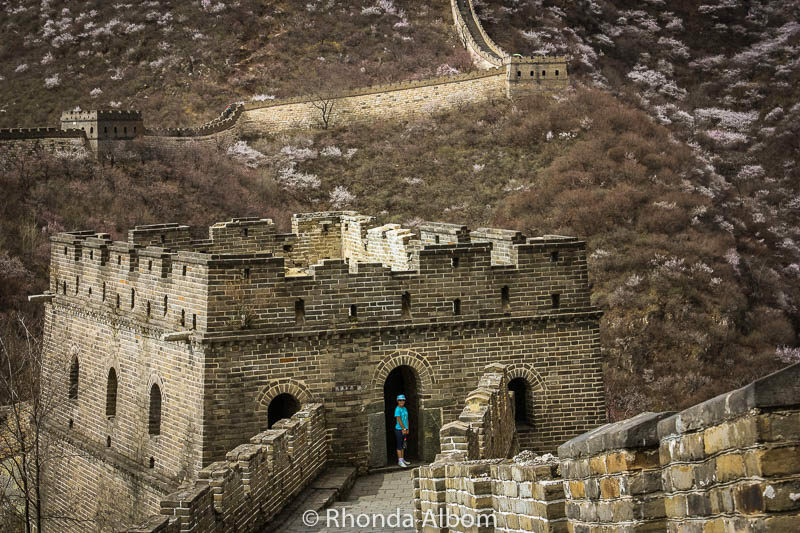 This is great – I’m hoping to do that race on the Great Wall the year after next. But if not, I’m book marking this! I didn’t know there was a race on the Great Wall. Beautiful photos. I always LOVE the tours you take us on. Places I’ll probably never be able to travel to. But i get to see wonderful photos of the areas. Thank you. Thanks Dawn. I am happy to take you with us through photos. Wonderful post and amazing photos! I’ve always wanted to go to the Great Wall. I’m so envious! maybe one day you will. Impressing place, and nice photos! I will never visit the wall, but it’s history is amazing. It’s good there is a cable option for those that want to see it, but can’t. My mom had Polio, so I know she’d be one that would take the cable car. How cool is that! You go see the sweetest things! I love all the surroundings. Lots to see for sure. We took the cable car to get to the wall and start our walk. Amazing photographs of the Wall in China. I always look forward to visiting your blog. Thanks. The wall is a fun one to photograph. WOW! How far were you able to walk the Great Wall of China? Was it very difficult to walk and would a person like me with a cane be able to walk it? Looking at your photos it doesn’t look like there were any towns or cities. How did you get to any particular location to start? I’m asking far to many question. I better stop because if I don’t I’ll be asking more questions. See ya Rhonda. We were on the Mutianyu section, and we walked the entire 3.4 miles and back. It was steep in parts, and many of the steps did not have handrails. From my understanding, Badaling is better suited for a person who walks with a cane. Both sections of the wall are about an hour outside of Beijing, and where we were it did seem isolated. We took the cable car up from the carpark, thus determining our start point. Thanks Steve. Most people visit Badaling, so the photos would be different. These shots of mine have not been shared before. hopefully I’ll walk it one day too.. I hope you get to. I’m so glad you wrote about this subject, Rhonda. My husband and I will be going on a cruise to Yangtze Rive in October and we were thinking of visiting the Great Wall as well. I am not sure if we’ll make it there, but if we do the information you provided will come in very handy. Thanks for sharing this. Thanks Anda, and if you are not a fan of crowds, I would go Mutianyu. Beijing is wonderful, and worth a visit while you are in China. Photo with the endless view is priceless! I posted my experience at the Great Wall from our recent visit. We also chose Mutianyu and didn’t regret at all. It was empty, serene and the views were priceless. I loved the comparison of the wall with the dragon, so fitting! Thanks Nano, that’s one of my favourite photos too. Mutinayu would do it for me Rhonda; fewer tourists 😉 Way cool review here. Thanks Ryan. The fewer tourists was the selling point for us. I created my signature as a .png and add it as a watermark when I export my photos. I use Aperture. It’s not as difficult as it sounds. You can do it in Photoshop too, but it takes more steps. It was a smart idea of our guide. We only asked for a visit to traditional Chinese medicine. Wonderful to read. It’s a very surreal experience and very exciting at the same time. Ohh Super… China is in my to visit list before I die! I hope you get there someday. It’s an interesting and amazing country . We have actually been to China, Shenyang and toured farm fields for our company. Spent a lot of time in the car, saw farmers still using donkeys to pull their carts. We loved the food, we were taken to so many wonderful restaurants that prepared special foods for us. We weren’t close the great wall, sounds like a wonderful excursion. Beijing was one of five cities we visited whilst in China. We took the train once, but mostly we flew, so we didn’t get to see as much real life as you did. And there’s that Chinese saying, you aren’t really a man until you climb the great wall… Or something to that effect. I think the wall is amazing. We climbed the Jinshanling portion – or I should say, I climbed a portion of the Jinshanling portion. But, I also love that you see pieces of it as you travel through China. So, does that mean I am a man now ?? And I guess you are too. I’ve never been to China and mostly likely will not be going, but the pics. of your adventures are amazing! That must have been an amazing trip. I’d love to walk on the great wall one day. When you get there, remember that the Mutianyu section is much less crowded than the more popular Badaling section. It is a bit further, but worth the effort. So as a stopover do they let you out of the airport. I would imagine not as we had to have our visas in advance. 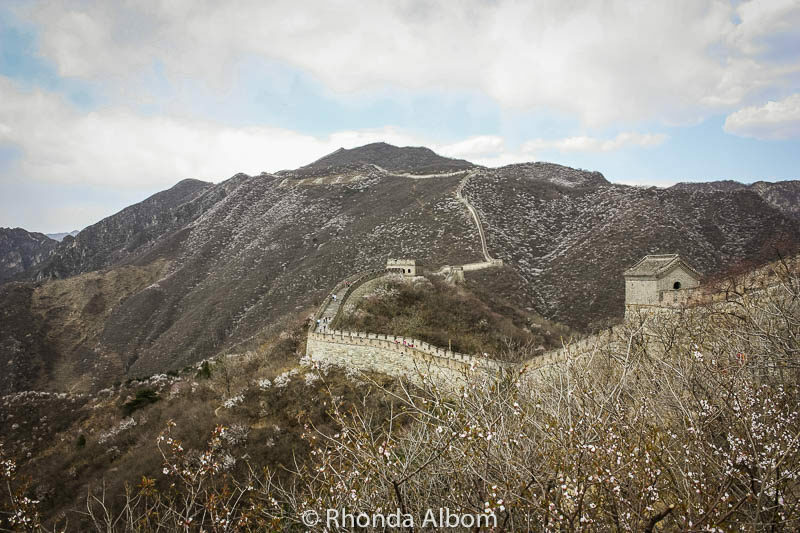 Walking this great wall is one of the only reasons I wish to visit China right now. That might change over the years but I think this walk would be amazing. That’s great that you managed to visit the great wall of china. I haven’t been there as yet. I can’t say I have a huge desire to visit China, but the Wall would be amazing, for sure. It’s definitely cool that you’ve done something like this! Wow.. I’m sure it’s a great experience to do this. Would love to be able to visit the Wall one day. Happy for you and your family. Never been but it looks amazing. I’ve walked along Hadrians a bit and round the walls of Chester many times.. They probably don’t come near to the great Wall of China! Rhonda, I love it. I’ve done this a couple of times, the first with the girls…barefoot! It was so darn hot! Fantastic! Ah, I guess I should have clarified. We drove the place to get our feet massaged. They were not related events, only in that they took place on the same day. My 7 year old has been begging to go visit China since he was 4 and first saw Ni Hao Kia Lan on Disney. He wants to try dumplings and walk the Great Wall, I want to see the Terracotta Army. I hope to take him in the next couple of years. I showed him your pictures and he thought they were great. Thanks for sharing! Honestly, I couldn’t tell you which of those two historical landmarks I preferred. I would also add a visit to Chengdu to see the Panda Research Center. We hired a private guide in Beijing for a few days to take us to the places we wanted to go. The foot massage was actually the first step on a well-check up in traditional Chinese medicine – a “free” event ended up costing a fortune in “herbal drugs” that all ended up in a bin somewhere as we traveled through the middle east.